The idea that an independent Palestinian state can peacefully coexist with Israel has been the cornerstone of many Arab-Israeli peace initiatives in recent years. But while significant shares of Israeli Arabs and Jews are optimistic about the prospect of a two-state solution, the Arabs currently in the Palestinian territories are less so. Half of Israeli Arabs (citizens and residents living within the boundaries of Israel, as defined in the 2008 census conducted by Israel’s Central Bureau of Statistics) say it is possible for Israel and an independent Palestinian state to coexist peacefully together, according to 2015 Pew Research Center surveys. By contrast, less than one-third of Arabs living in the Palestinian territories say a two-state solution is possible (28%). Jewish public opinion in Israel is divided on this question – 43% say a two-state solution is possible, while 45% disagree. However, both Israeli Arabs and Arabs living in the Palestinian territories share a common skepticism about current efforts to achieve a peace settlement. 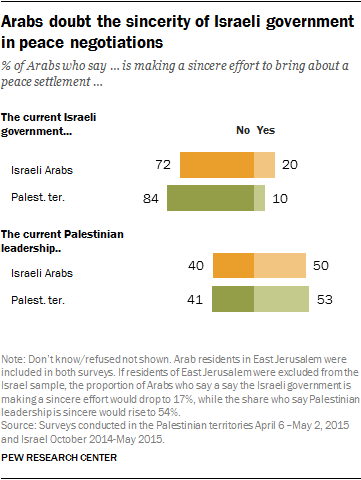 Most Israeli Arabs (72%) and Arabs living in the Palestinian territories (84%) say the Israeli government is not making a sincere effort to bring peace to the region. But Arab skepticism about the sincerity of Israeli politicians extends, to some degree, to the Palestinian leadership as well. Half of Israeli Arabs say Palestinian leaders are making a genuine effort to bring about peace with Israel, while four-in-ten say they are not. At the same time, only 53% of Palestinians say their leadership is making a sincere effort to reach a peace, with 41% saying they do not think this is true. Skepticism about the Palestinian leadership is more acute in the Hamas-controlled Gaza (49% say leaders are not making a sincere effort) compared with those in the Fatah-controlled West bank (36%). Additionally, many Arabs in the Palestinian territories are convinced that armed struggle is the best way for them to achieve statehood. In 2015, 38% said this was the case, with 22% preferring negotiations, 20% advocating nonviolent resistance, and an additional 16% preferring a combination of these options. Among Palestinians living in Gaza, half say armed struggle is the best way for Palestinians to achieve statehood. Note: Read the survey methodology and topline results for views of those in the Palestinian territories.